Thousands and thousands of individuals and families are contributing to the FamilySearch.org indexing project sponsored by the LDS Church. 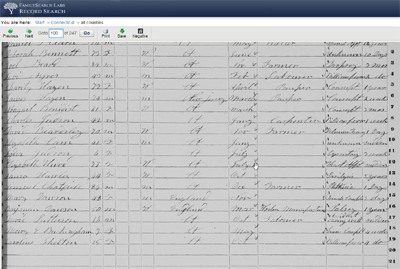 In essence, family history enthusiasts are given an image of a page from an old census and transcribe or “index” certain elements and records on the page so that the information can be searched by computer. Many people have wondered where they can search the genealogy information found in the Indexing Project. As of this writing, the information can be found at the “Labs” section of FamilySearch.org. Information has been indexed from various countries including the United States, England, Mexico, Canada, and many others. Search the indexed information or even browse the images of the original documents. The interface is fairly intuitive and is not cluttered by too many links or instructions. The site appears to be using some sort of AJAX or AJAX-like programing which means the web page doesn’t need to be refreshed each time you click on a link or enter information. This saves a lot of time if you’re on a slower Internet connection and it makes for a better look-and-feel for the website. This search site will probably graduation from the Labs section at some point, but it’s great to have access to the records even while the project is still in its beginnings.